I’m Using Pretzels. They Represent My Twisted Emotions. This is me this week, guys. Minus the mustache, fortunately. I mentioned a couple of posts ago that Julie, a beloved coworker of mine, would be leaving the office for snowier pastures. Well, the time has come. I can’t tell you how sad I am. I’m so sad that I cried big Indian baby tears (Indian tears are bigger and hotter than normal tears) at the staff meeting during which she revealed she’d be leaving. Yes, she reads and often comments on the blog, which is greatly appreciated. But it isn’t just about that. Rare is the coworker who can make you feel “at home” at a place of work on your second day. At least, that’s rare for me, because I am usually mute and terrified for my first week of any job. She is one of the people I can credit for helping me to really come to enjoy and love this place, and one of the people I can thank profusely for helping me get through some dramarama not too long ago. I can’t really imagine this place without her. For these and many more reasons, the woman deserved a baked good. 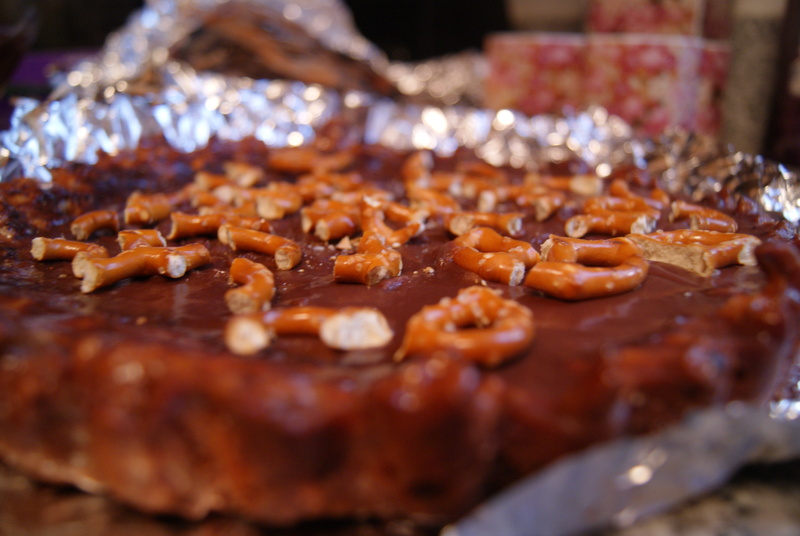 I decided to go with something chocolate and pretzel-related because she once brought in a bag of Trader Joe’s chocolate covered pretzels and we all went to town on them. I also decided to pick the most complicated dessert ever because I’ve been lazing on the sweets-making lately and, well, if anybody deserves a treat that requires a couple of days of effort, it’s Jules. Finally, I didn’t realize it would be complicated when I committed to it. That last sentence is pretty much the story of my life, though. Sigh. The stars of this dish. You’ll also need a 10-inch tart pan with a removable bottom, but make sure it’s not too removable. As in, make sure you won’t have to deal with any chocolate leakage at the conclusion of your baking adventure. Want to know how I know this? I think you know how I know this. First, let’s work on the crust. Even though this is fancy, your clothes while baking this need not be. In fact, please wear the rattiest duds you’ve got, because you will get messy. In a large bowl, with an electric hand mixer on low speed, slowly mix together the butter, sugar and 3/4 cup of the pretzels until creamy. It won’t be completely smooth, but you do want it to look like fluff with a few pretzels thrown into the mix. When you’re here, mix in the flour and the egg, then add in the remaining pretzels. Roll out the dough between two pieces of wax paper, flattening it as much as possible without having any spill out through the sides (why yes, this did happen to me). Refrigerate for at least 30 minutes, until completely chilled. Take the dough out, flatten it to about 12 inches or so, then roll it out over your tart pan. Press the dough into the pan, patching any holes and removing any extra pieces hanging over the sides. Refrigerate for another half hour. Told you this would take some time. I hope you’re watching a Law & Order marathon or something to keep you occupied. Let the crust cool for about 10 minutes. While that’s cooling you can go ahead and melt down the bittersweet chocolate. Brush it over the crust and up the sides. 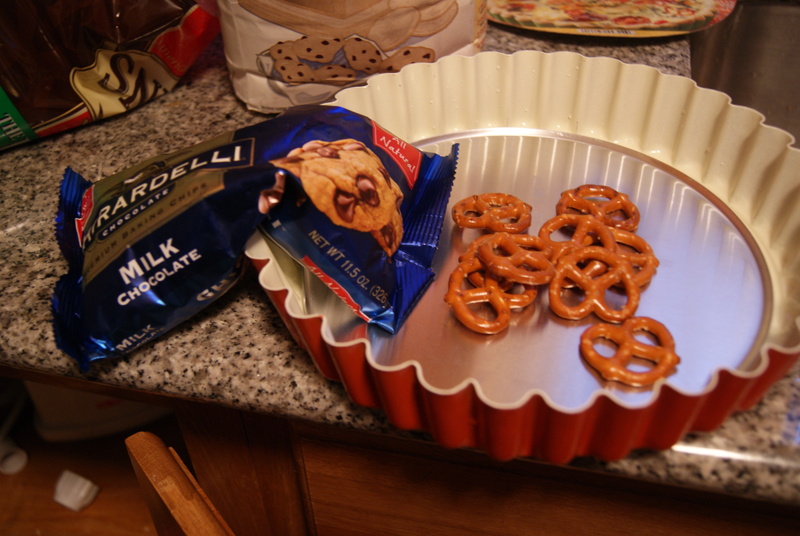 I do not play when it comes to pretzels and chocolate, people. While this is cooling, make the filling. In a small saucepan, bring the heavy cream to a simmer. Remove the pan from heat, stir in your milk chocolate, and continue to stir until the mixture’s melted down completely. Set aside to cool to room temperature. Or, you could send it into the fridge for about 20 minutes if you are pressed for time. I had to somehow wake up for a job the next morning, so I was pressed for time. Pour the cooled mixture into the cooled crust. Then, BEWARE. Like, really, beware. If your tart pan was as, um, delicate as mine, you will have chocolate oozing out of the bottom, creating a sticky (albeit delicious) mess. Don’t worry, your entire mixture will not get sucked out through the very bottom. 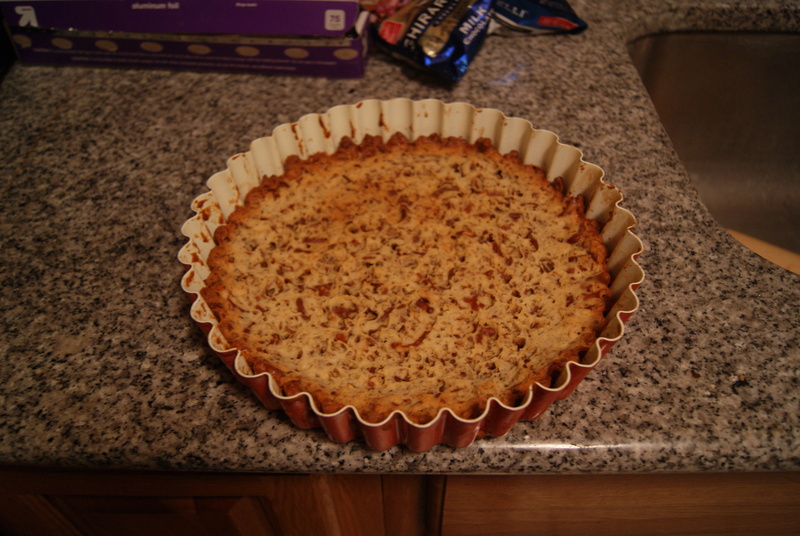 In fact, once I was completely finished, the tart looked perfectly level. But I did have to worry about chocolate-y counters and floors, so I am just warning the rest of ya’ll. Have some tin foil or something ready beneath your pan. Send it into your fridge to set for at least four hours. I’d recommend an overnight trip, though. When the filling’s set, break some pretzels over the top for garnish. The in yo' face shot. In addition to being fun to make, it is and was SO worth the effort. I brought this to work and had completely forgotten that we only have those baby plastic knives, which made this nearly impossible to cut. So instead, a few of us classy ladies dug in with our hands. Yum. Jules, you’ll be missed more than I can tell you in a wee little blog. Who will want my pregnant unicorn drawings now? ← May Contain Whiskey. Can I See Some ID? Oooooh Sybil! 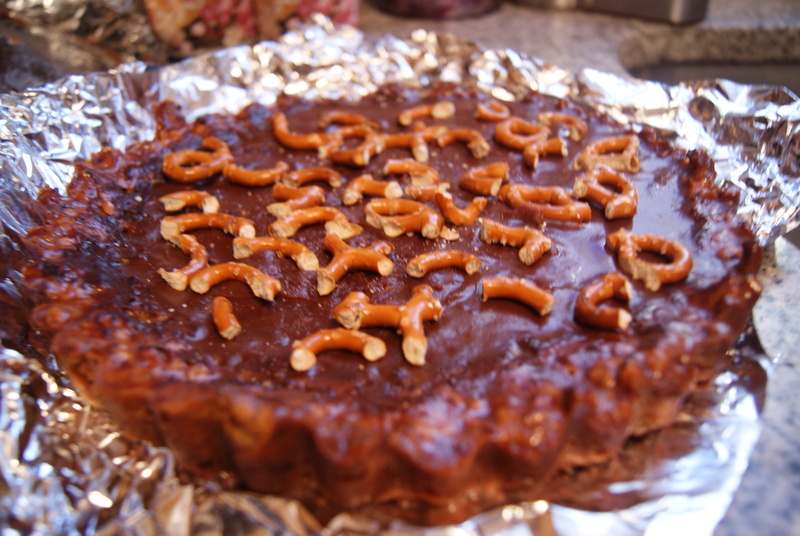 I cannot believe the great lengths that you had to go to in order to make that delicious, delicious tart. Now I’m sad all over again (partly bc I wish that I had taken it and eaten it binge-style all by myself.) haas It was amazing and I am still sooooo flattered that you baked for me! Thank you, Shibow. Xoxoxo. Ps I don’t think that I will ever make this as it is waaaay too hard. However, if you do….. Hahahah selfish!!! I miss you already and it’s only been a freaking day!